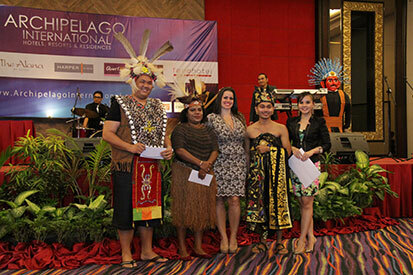 Jakarta March 2015 – On March 24th, during the celebrated annual “Archipelago Fair Trade Show”, previously known as the “Aston Fair Trade Show”, a tourism industry business to business event that brings together hundreds of representatives of Jakarta’s Travel Trade Industry, Media Communities and Archipelago Hotels from far and beyond Indonesia and Malaysia, Archipelago International, the leading Indonesian Hotel operator, took the opportunity to announce the group's future development plans and introduce their new VP Sales & Marketing, Ms. Tenaiya Brookfield. Ms. Tenaiya Brookfield began her career with Archipelago International creating and developing the group’s entire centralised ecommerce, online marketing and reservation divisions as their Corporate Ecommerce Director. Her team has lead the industry in sales online, gaining awards for the highest production in the country. Her eye for detail and creative visions will keep Archipelago at the forefront while the sectors between the online and offline sales and marketing worlds merge into the technology driven hands of the future. Ms. Tenaiya will be replacing Mr. Norbert Vas who after spearheading Archipelago International's Sales & Marketing effort for 7 years has been appointed to the role of VP Business Development & Operations overseeing hotel operations in Malaysia, Sumatra and Western Java and driving the companies future international expansion. During the Archipelago International Fair Trade Show the company will also proudly announce its 100th hotel opening at the beginning of 2015 with another 80 in the pipeline through 2016. The group continues to be the preferred hotel management company in Indonesia with its wide range of brands to meet a variety of market needs. The newest hotel set to open is under the Aston brand, located in the heart of TB Simatupang’s business district in South Jakarta. Aston Priority Simatupang Hotel & Conference Center will open its doors to guests in mid April, with 296 rooms and suites, 12 state of the art meeting rooms, and a ballroom for up to 800 delegates. Visit www.Aston-International.com for more information. 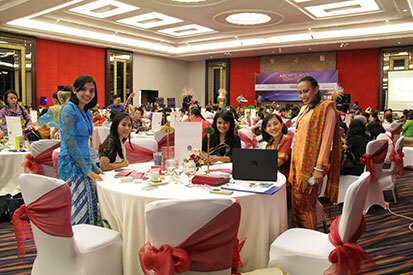 “This is a very exciting time for hotel growth in Indonesia as well as development and changes within the industry. I am thrilled to head up such a hard working and dynamic team in our corporate offices working hand in hand with over 13,000 employees within our hotel units. We are always looking for the best and brightest in the industry to join our growing family. With our easy online application system, candidates can go directly to our website to submit their CV and application at www.ArchipelagoInternational.com” Said Ms. Tenaiya Brookfield, Vice President of Sales and Marketing at Archipelago International. 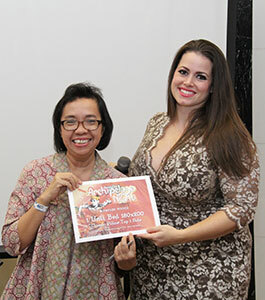 Seen in the image : Ms. Tenaiya Brookfield as Vice President of Sales & Marketing awarded prize to Mrs. Mimi Hudoyo of TTG Asia as a door prize winner. Seen in the image : Ms. Tenaiya Brookfield as Vice President of Sales & Marketing with unit hotels participants best costume. Seen in the image : Aston Fair 2015 Table Top, with "Archipelago Night" as the theme. Archipelago International is one of Indonesia’s leading hotel operators with an underlying portfolio of 100 hotels and 14,000 rooms. As a continually expanding brand, Archipelago International has a development pipeline exceeding 95 properties in Indonesia, the Philippines and Malaysia. Archipelago International hotels operate under the hotel brands favehotels, NEO, Quest, Harper, Aston, Alana, and Kamuela, ranging from ultra luxurious private pool villas to serviced apartments and select service economy class hotels, thus offering Indonesia’s vastest and most comprehensive hotel network.